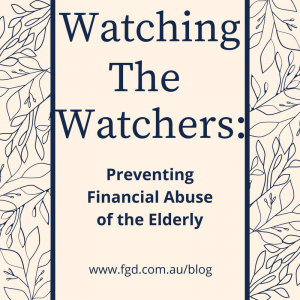 Elder abuse – particularly financial abuse – is becoming a big issue and I see it too often in practice. Hopefully positive changes geared at protecting our clients will come from this. We will be keeping a close eye on any changes. When clients appoint trusted family and friends as their attorney they rightly expect that they will act in their best interest. Unfortunately this does not always happen.I regularly prepare enduring powers of attorney for clients. Most of the time it is a routine process. Perhaps spouses are appointing one another but sometimes my gut tells me I need to be more cautious. An attorney holds a position of considerable trust, so the law places considerable restrictions on them. An attorney cannot, for example, use the funds of the person who made the power of attorney (referred to as the ‘principal’) for the benefit of anyone other than the principal – unless the principal has given their express permission. Unfortunately, there are few people who can actively supervise the actions of attorneys. Once an attorney is appointed and the principal has lost capacity then the attorney is usually the only person who can access the evidence necessary to prove the attorney’s wrongdoing. It can quickly seem that attorneys can be laws unto themselves. The ACT Civil and Administrative Tribunal has the power to supervise the actions of attorneys, give them advice, give them directions, and – if necessary – remove them. Applications can be made by anyone who has an interest in the welfare of the principal. I have been involved in applications brought by an attorney, family members of the principal, treating medical practitioners, social workers, and the Public Trustee and Guardian. After a person passes away the attorney loses their powers and the executor takes over in an analogous capacity. The executor has a duty to protect the estate in the interests of the beneficiaries. The executor is therefore obliged to review the actions of an attorney (even if it involves reviewing their own actions) and consider taking steps to recover any misappropriated funds. If they fail to do so they may themselves be liable for any losses suffered by the beneficiaries. If you have any questions about the preparation and execution of Enduring Powers of Attorney, about your rights and obligations as an attorney, or if you have concerns about the actions of an attorney then you should contact the FGD Estates team.